The 38.71 metre IAG motor yacht ME has had a central agency change and is now listed for sale with Atlantic Yacht & Ship. Delivered in 2014 as part of the Primadonna 127 series, ME has a GRP hull and superstructure and is built to RINA Pleasure Class. She features naval architecture and both interior and exterior design by YD&AS, which penned the series. This semi-displacement yacht for sale can reach 17 knots and is comfortable even when at anchor thanks to her zero speed stabilizers. ME can accommodate 10 in five cabins, with space for five crew. The master suite has a number of notable features including an opening port light, a window on the ceiling and access to a private en suite head/Jacuzzi. The rest of the accommodation is split across a VIP suite and two starboard guest suites, all of which are en suite. Her flybridge offers the chance to take in the surroundings in style in her Jacuzzi or utilise her speakers, grill and large table to entertain guests. ME is also appealing for sun worshippers: her flybridge lounge and foredeck sun pads are ideal for sunbathing. Inside, ME’s saloon and sky lounge extend to her exterior, with sheltered areas to blend inside and outside living. She features a hand crafted Italian interior with natural wood veneers and stone accents used throughout to create a light and traditional interior. 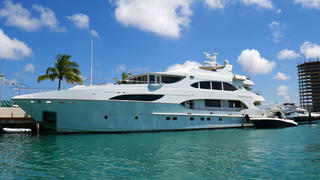 Lying in Dania Beach, Florida, ME is asking $8,995,000 with Atlantic Yacht & Ship.